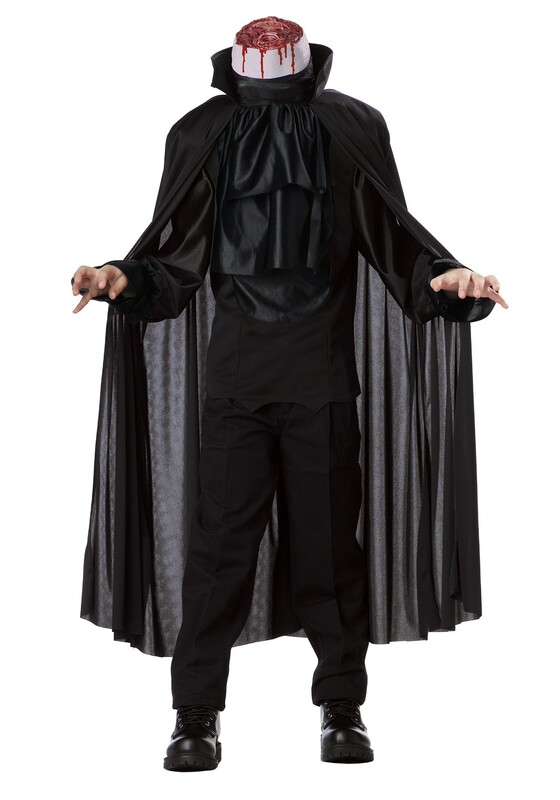 This Halloween season, your child can scare all of the villagers while bringing the legend of Sleepy Hollow to life in this Kids Headless Horseman Costume! The name Ichabod Crane is inextricably linked in literature with the Headless Horseman, and a few people who haven't read Washington Irving's actual story may mistakenly think that Crane WAS the Headless Horseman. He wasn't. Ichabod was the schoolmaster in the fictional village of Sleepy Hollow, and he encountered the Headless Horseman, believed to be the ghost of a Hessian mercenary from the Revolutionary War, while riding late at night back to the village from a party at an outlying farm. He had made a proposal of marriage to the farmer's daughter, and had been rejected.He was never seen in Sleepy Hollow again. The next morning his unsaddled horse was found wandering, the saddle trampled, and a smashed pumpkin lying alongside Crane's hat beside the road.Wear this ensemble with your own black pants. And for a more realistic touch, carry one of our pumpkins as a prop. Everyone will want to escape this spooky creature whose head was blown off by a Revolutionary War cannonball!